The game selection when the PS4 launched, for lack of a better phrase, left a lot to be desired. 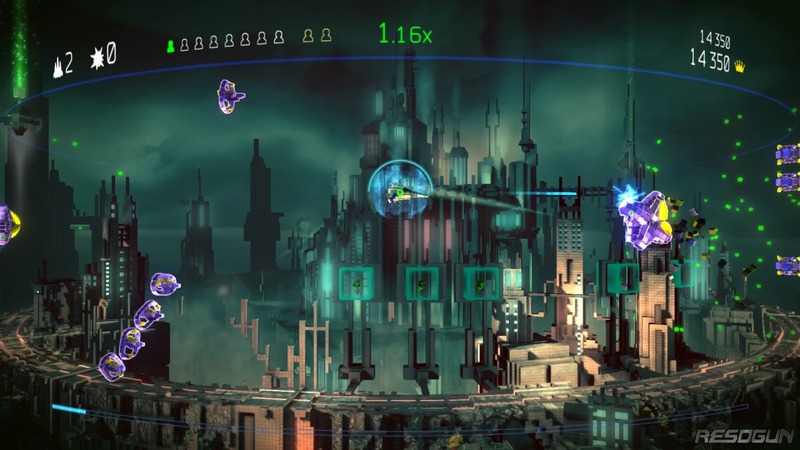 As such, if you were a PS+ subscriber within the launch window, then you are probably already familiar with the title Resogun. Even if you weren’t a sub, you might have picked up developer Housemarque’s initial venture onto the Playstation brand simply due to a lack of other options. That being said, defeating all of your enemies won’t be as easy as it sounds, nor should it be. Not because of the controls mind you, which you will feel comfortable with right away, as they are as fluid and responsive as you could ever hope for. The difficulty is in all of the chaos going on around you at any given time. After a very slight introductory period the game will start to throw entire armies worth of fodder at you within minute long intervals. It is at this point that you will have to adapt to having your attention divided between the enemies in front of your ship, the projectiles from the turrets on the ground and even the debris coming up behind you from the enemies you just killed or you will perish yourself. Luckily the levels spawn enemies in a set pattern. So as long as you can learn from your mistakes and pay attention when you die you will eventually begin to memorize the order and direction of the incoming onslaught. While this might be enough to squeeze through to the next encounter, like always, there is more to it. Beating the levels is often not enough for everyone as there are scores being kept and leaderboards for you to compare yourself against other players. Just how do you go about getting a higher score? Good question! Points accumulate by completing specific feats during the course of a level. The biggest of which are combo multipliers and a human rescue bonus. The first of which is done just as you would expect, kill enemies in succession without a gap of a few seconds in between. The more kills that you can chain together the higher that your multiplier will climb and therefore the more points that you will gain. During the course of this killing you may come across a series of enemies with a slight green glow. These are the gatekeeper enemies and their death will open one of the many cages within the level housing a human captive. You must then get to the human and carry them to an escape pod, but don’t doddle as they can be hit by enemies or even friendly fire denying you credit for the rescue. 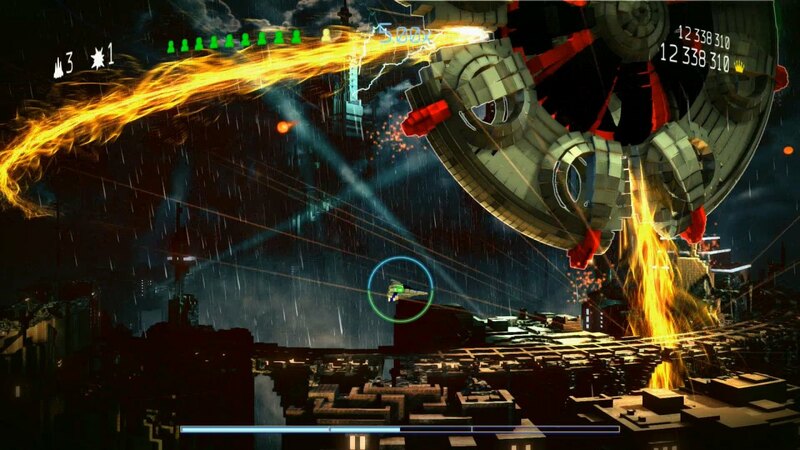 Now that you are familiar with all that you have to kill, dodge and rescue as well as have memorized the levels enough to get through them, its boss time. That’s right, you can’t forget about these screen filling monstrosities. Impressive in design and scope, these encounters are levels in and of themselves. You will need to pick and choose your moments carefully in order to bypass a shield or attack pattern in order to do some damage and escape to a safe spot to plan your next attack. The nice thing about these bosses is, that like the levels, they have set attack and movement patterns that you can memorize in order to refine your strategies. At this point you might be thinking that the deck is stacked quite thoroughly against you, that’s because it is. In order to avoid being viewed entirely as inconsiderate jerks however, the developers have provided you with some help. Do you enjoy saving up energy until you can unleash a short but really powerful attack or do you prefer to dash around creating shockwaves that destroy ships in a small radius? 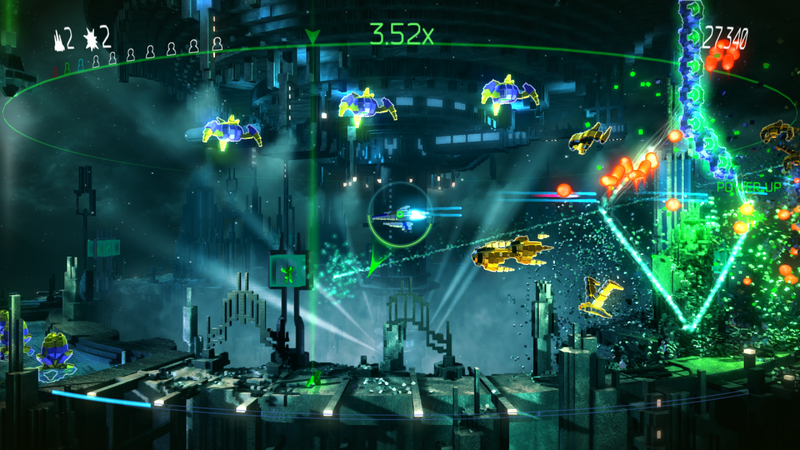 All three ships have their own set of stats in regards to agility, boost and overdrive so that you can pick a ship more catered to your preferred play style and go. Regardless of the ship that you select, you will have a set number of bombs and shields that you can carry with you. These power ups can be replenished as you play through the game as pickups or sometimes as rewards for human rescues so that you don’t always have to save them just for the boss fights, though they are super helpful there. Lastly, if all of that plus your personal skill level is not enough then just call up a friend to help you out in the online co-op mode. It is a shame that there isn’t a couch co-op option, since the game is perfect for it, but there is no shortage of people playing online. Personally I was divided on the topic of graphics in this game as I have never really been impressed with a voxel based design. Sure there is a lot that can be done with it in order to inject a level of personality into a game but it just doesn’t give off the impression of vast detail that I like from my next gen offerings. It’s not all bad however as the five levels backgrounds in particular are well done and actually add a level of depth to the imagery that is quite impressive for a level that goes in a cyclical rotation. If you can look beyond all of the explosions, attacks and moving parts you will see that the avatars in the foreground itself are all quite plain. Step aside Lego Star Wars; this is the one true game that can be described as blocks in space. Graphics however are not to be confused with design or presentation. As much as I am not keen on voxels, enough cannot be said about how they were used by the developer to hit the ground running with the capabilities of the then new hardware. Over 200 million voxels could appear on the screen at any given time all moving in different directions in the form of enemies, projectiles, and backgrounds with little to no slow down from the hardware. That itself is an accomplishment. This all brings us to the most important question, is it fun? 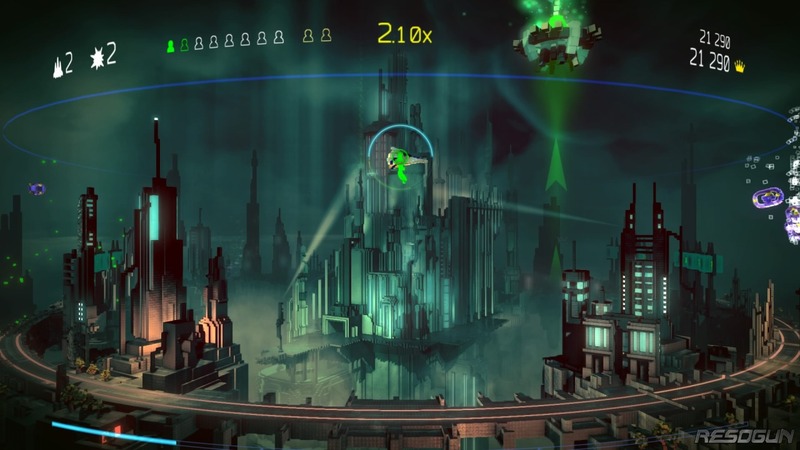 Resogun is in my mind a poster boy for the simple but fun arcade style game. It is beyond easy to just get completely absorbed in it and fall into the “one more level” mindset. If you are still unsure about it, ask a friend with a PS4 as a majority of them have probably already played it. Even if I did not get it free with my PS+ subscription it would be in my collection for its very reasonable full price of 14.99 and seeing that it’s also available on PS3 and Vita, it should find its way into yours.